If Wall Street’s bears are going to fatten up at all before this year is through, they will probably have to capitalize within the next few weeks on hunting opportunities that suddenly seem more plentiful. The S&P 500 is still up 8 percent in 2018 after slipping 1 percent last week. Neither the bullish uptrend in the major indexes nor the upbeat tone of economic and corporate-profit growth has been upended. Yet so far in October, several factors have slowed the market, which could make it easier for the bears to catch and take a bite out of stock values. The climb in bond yields was the most obvious source of pressure last week. The 10-year Treasury yield pushing to seven-year highs above 3.2 percent is another stress test for equity valuations. Sure, it’s happening largely due to good news. But the yield on the lowest tier of corporate investment-grade bonds is back to 5 percent for the first time since mid-2015 — even as credit markets remain flush. This raises the cost of capital at the margins and pinches cash flows. With the onset of October, Federal Reserve officials apparently decided to talk up the prospect for several more rate hikes due to strong economic activity — an attempt to pull market expectations toward the Fed’s own forecast for a few more rate hikes in 2019. Bespoke Investment Group’s Fedspeak monitor quickly shot from neutral to hawkish readings last week. Rapid earnings growth has been the very premise of the market’s advance this year. It’s less true that the market “became cheaper” since January as the S&P’s forward price/earnings multiple fell to 16.7 from 18.5 than that an uncommon late-cycle earnings surge had bailed out an expensive market. Third-quarter earnings are on track to climb nearly 20 percent, but the forecast revisions heading into reporting season have again begun to track the usual pattern of reduced estimates and more-frequent corporate guidance cuts, says Deutsche Bank strategist Binky Chadha. What’s more, companies reporting in September have seen their shares clipped by more than 1 percent the day of their earnings announcements — a harsher response than in recent periods. For sure, downward revisions often precede a relief rally when numbers arrive. But this pattern still shows the market is sensitive to signs of decelerating profit growth on the way to the first quarter, when growth is anticipated at only around 7 percent. The rhythm of the market itself also leaves stocks potentially vulnerable to a bear assault. The “average stock” has been lagging the big-cap indexes badly, as most observers have been highlighting lately. Fewer than half of all S&P 500 stocks are above their individual 50-day moving average, which means most stocks are not in a short-term uptrend. Weaker market breadth sometimes — but far from always — precedes a deeper setback in the headline indexes. Big Tech has faltered, too, with semiconductors and then each FANG stock pulling back significantly. Political scrutiny has coincided with an the outsized weighting of tech in the market that has tested investors’ appetite for the sector. And emerging markets sagged last week — making their recent rally look like mere bounces within oppressive downtrends rather than decisive recoveries. And with the recent softness in the S&P 500, the index now sits less than half a percent above the 2,872 level of the January high, which capped the market for seven months. A further pullback below that threshold will no doubt get the bears growling about a possible “false breakout” or “double top” — cosmetically reminiscent of the market peaks in 2000 and 2007, when an early-year record high was approached or barely exceeded several months later before the indexes buckled into a bear market. October also means a suspension of most corporate-buyback programs around earnings season, which likewise could embolden the bears. While I’ve argued that heavy buyback activity was more a background factor and psychological crutch for investors rather than a direct driver of stock prices, it’s also true that some patients get sick right around the time they stop taking a placebo. One skeptical observation of 2018 is just how much profoundly good news it has taken to muscle the S&P 500 higher by “only” 8 percent: 20 percent profit growth, 3.8 percent unemployment, a 3-4 percent GDP pace, and some $1.2 trillion in annualized cash sent to shareholders this year via dividends and stock repurchases. What happens when the news gets slightly less great? So there’s the bear buffet laid out for October, a month already living up — in a modest way — to its reputation for increased volatility. 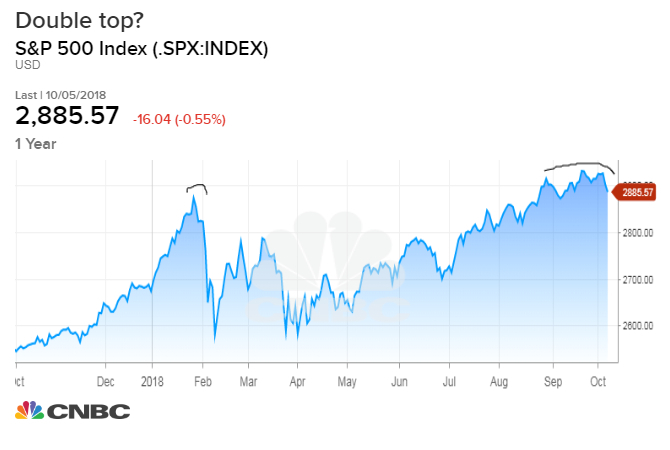 But this same set of facts could be used to argue that the market is already simply undergoing a “stealth correction,” with a hefty minority of stocks already knocked down more than 10 percent from their high, refreshing the tape for another upside attempt. The S&P 500 is now oversold — statistically stretched to the downside — the way it was in late June before a sharp multimonth rally. And bearish options activity finally became extreme late last week, looking a bit like the spike in anxiety that likewise has ushered in bounces. The point being, there’s an opportunity for the bears here, but there’s a chance they’re close to having inflicted about as much damage as they can for now. The character of the market has certainly changed, from 2017’s “relentless rally” to this year’s “grudging gains.” And the January high might prove the peak for momentum, sentiment and valuation for this whole market phase. But that doesn’t mean the bull market is spent.